Sometimes your heroes let you down. And then sometimes your heroes are Bob Goff. This weekend author/lawyer/”real-life Great Gatsby” Bob Goff led the first ever Love Does Stuff conference in Tacoma, WA. My girlfriend and I were lucky enough to be able to attend, all thanks to the graciousness of a few loving people in our lives. I’ve looked up to Bob for years. Meeting and hearing from him in person did not disappoint. Bob is way taller in person. And he gives amazing hugs. 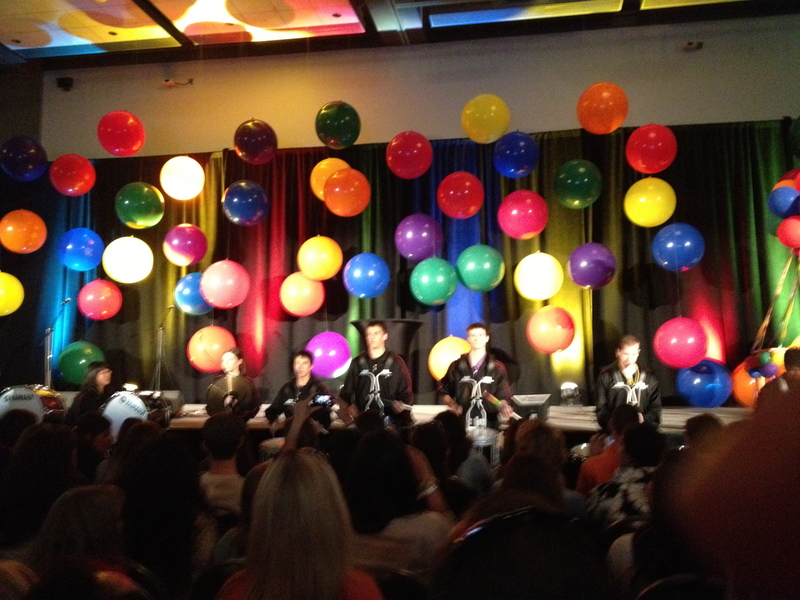 Every conference should start with a drumline performance, and balloons make everything better. Anyone can solve a conflict between two countries. In the conference center lobby were a half dozen tables with Sharpies on top (and balloons, of course). 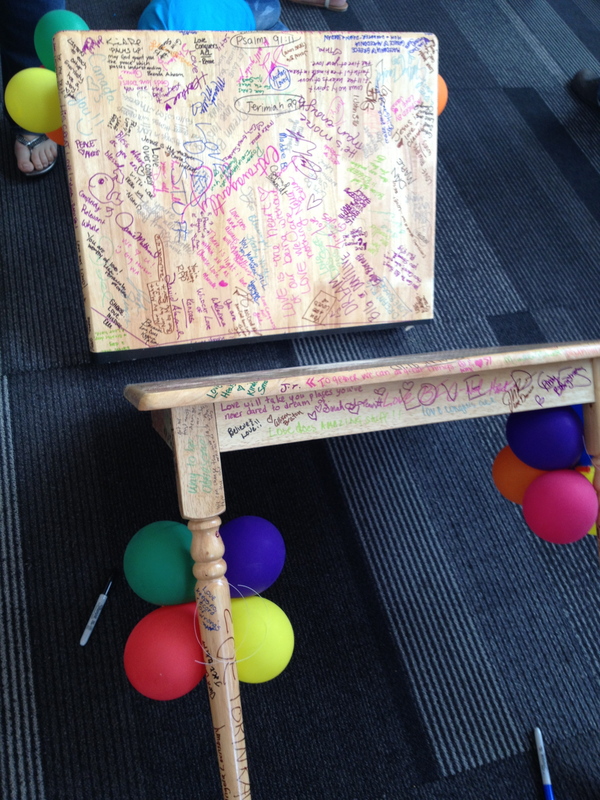 Guests were instructed to sign the table and leave a message of love. Bob later explained that each of these tables would be cut in half. Each half would be given to an influential world changer, including world leaders from countries feuding with each other. Bob can do that – he just happens to be the United Nations consulate for Uganda. The message was that love doesn’t ask just ask people to come to the people – love tells people they are welcome at the table. Our schedules are not in charge of us. Take orders from love, not from the calendar. This came from Joshua DuBois, the former faith counselor for President Obama. Josh sends a devotional every morning to the President. Because the President asked him to. That’s cool. Brandon Heath is all sorts of awesome. Be not afraid. Be not afraid. Be not afraid. Be not afraid. The most common command in The Bible. One which should be etched upon our hearts. God sees us not for who we are. He sees us for who we are becoming. “What is done today can never be undone.” Bob explained in Ugandan courts, when someone is given the death sentence, the judge will sign their sentencing and break the pen he used in half to symbolize how his order cannot be undone. Jesus did the opposite when He saved us from death. He ripped our death sentence in half and set us free to follow in His footsteps. Ultimately, this was the message of Love Does Stuff – figure out what Jesus did and do a lot of that. 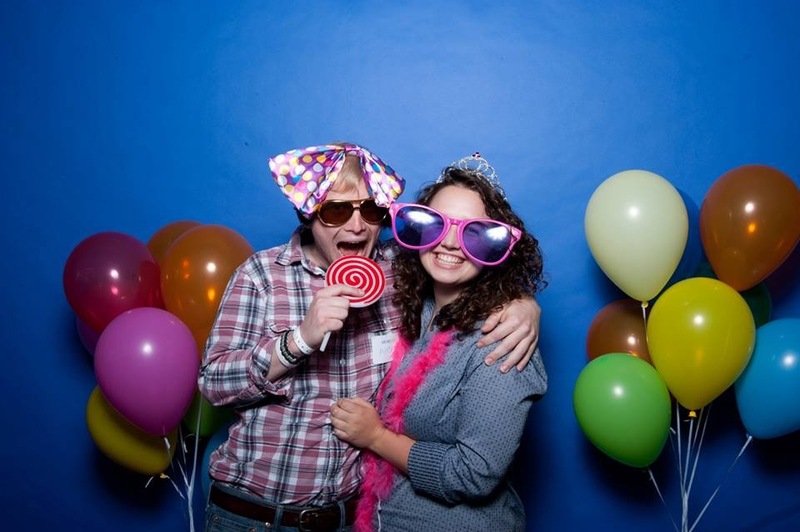 Did you go to Love Does Stuff 2013? What did you take away from the conference? How can you leave fear behind and do more of what Jesus did? And #25 is fascinating… never heard of the interrobang, would have guessed that word was made-up?! Just found your blog on the #LoveDoesStuff2013 twitter feed. Everything you wrote here…yes! Thanks for capturing a snapshot of the most motivating 2 days I’ve had. Thanks – there was so much encouragement, love, and joy in that room. I hope we can bring it all out to the world. Thanks for giving me a little taste of Love Does! I would have enjoyed it very, very much. Now to pay attention to do what Jesus did! Thanks Dave. I guess you’ll just have to go to Love Does Stuff 2014! I loved that the conference was not one that as I walked out the doors, so did my enthusiasm. Quite the opposite, really. It renewed me. What the speakers had to say spoke to the depths of my being. I carry my Love Does Stuff notebook in my purse, full of the little *nuggets* of inspiration, and I find myself pulling it out often. **It has worked out well that what I quit last Thursday was to Stop using *yelling* as a way to communicate — surprisingly, it hasn’t been difficult; and I feel so much more at peace with myself and our toddlers, whom I love desperately! **This has been great because it is a confirmation to my husband and I. I quit my job last year to get a new degree, one of which I had never considered, but *know* is the *next step* for me to live out the purpose and passion I have; and my husband put in his notice 2 months ago to finish out his current contract but he will not be returning; and so we have NO income lined up, but we are trusting that our leap of faith was the right choice, and are *excited* about what our 2nd steps are!! **This one CHANGED my life! I have never known how to get past/through the traumatic (to me) events that have forever shaped who I am, how I respond, and how I participate or don’t in things. To have had opportunity to verbalize “The three things you need to know about me to ‘get me'” has helped me, in insurmountable ways – even in a week! I came home and shared these with my husband (of 9 years), and while he knew these things about me, I was able to express how they shaped me. Additionally, I have had opportunity to share with others this week, and have *permitted* them to know me better – I have removed the stick at which I once held them at a distance. *I will end, now that I have taken up more room that your wonderful, original post. Thank you! Great words Amy. Thanks for adding to all the lessons, and reminding me of a couple. I’m so glad the conference spoke to you and I hope God continues to do great things through you! Thanks for summing up all of my notes for me 🙂 It was an amazing life changing conference. My husband and I came home motivated, encouraged and definitely loved on. What are you and your girlfriend going to do to change the world?